For an outline of all engines used by American Motors, see list of AMC engines. 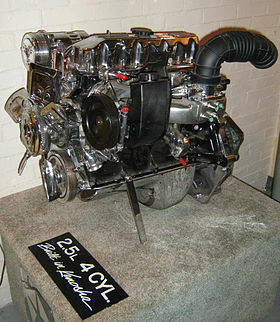 The American Motors Corporation straight-4 engine was used by a number of AMC, Jeep, and Dodge vehicles from 1984 to 2002. American Motors devoted three years to the development of a new four-cylinder engine. The brand new engine was designed to use AMC's existing spacing between the cylinder bores so that the tooling remained the same. The location of other major components, such as the distributor, oil filter, and starter, were also kept the same so as to use the machine tools for the AMC straight-6 engine. According to Jeep's chief engineer, Roy Lunn, "unlike most engines available today [it] was not designed for passenger cars and then adapted for trucks. We specifically developed it with our Jeep vehicles and Eagle in mind. That's the reason that performance and durability were of such prime consideration from the very beginning." Although some of components were interchangeable between the AMC 258 cu in (4.2 L) six-cylinder and the new engine, the four-cylinder was not a cut down version of the big six. Noted Roy Lunn, "There are some common parts, but the 4-cylinder includes many unique items such as its own electronics systems. It also has a shorter stroke and larger bore. The valves are larger and the pistons are new." Roy Lunn recalled: "We wanted as much displacement - for power and torque - as possible within the confines of bore centers of the tooling. The only parameter we could influence substantially was stroke. So we picked the largest bore and stroke in order to get 2.5 Liters." The AMC 150 cu in (2.5 L) engine has a bore x stroke of 3.875 in × 3.1875 in (98.43 mm × 80.96 mm). The head features a combustion chamber and port design that was later used on the 4.0 L — the 2.5 L I-4 head lost two cylinders in its center, opposed to the six-cylinder engines. The 2.5 engine also features five main bearings and eight overhead valves. Instead of the standard AMC bell housing bolt pattern, AMC/Jeep engineers adopted the General Motors small V6 and four-cylinder bolt pattern (commonly used with GM's transverse-mounted powerplants) for their new engine, because the new AMC 2.5 replaced the four-cylinder engines that had been purchased from GM; and because AMC continued to buy the 2.8 L V6 from GM until the 4.0 L I6 was introduced in 1987. The four-cylinder and V6 shared the same drivetrain components, whereas stronger transmissions were needed for the new 4.0 L. The 2.5L also shared an 18mm threaded oil filter used with the GM 2.8L (ACDelco PF47 or equivalent) to 1986; when the 4.0L was phased into production with the XJ the oil filter was changed over to a 20mm thread size shared with Renaults until 1991. The AMC I4 first appeared in 1984 model year with the new XJ Cherokee. In 1986 the head went under a minor revision, the head bolts were increased from 7/16 to 1/2 inch. From 1997 to 2002 it was marketed as the "Power-Tech I4". It was produced through 2002 for the Jeep Wrangler, as well as for the Dodge Dakota pickup that also featured the AMC/Jeep designed four-cylinder as its standard engine from 1996 through 2002. This lightweight engine is similar to its "big brother" 4.0 L, and although not powerful, it is durable with no reliability issues. Output the final year was 121 hp (90 kW; 123 PS) at 5400 rpm and 145 lb⋅ft (197 N⋅m) of torque at 3250 rpm using sequential multiple-port fuel injection (MPFI). For comparison, the 258 I6 provided 112 hp (84 kW; 114 PS) at 3200 rpm and 210 lb⋅ft (280 N⋅m) of torque at 2000 rpm in its final year with the computer-controlled carburetor. For several years, the engine was detuned for the Wrangler; from at least 1992-1995, it produced 130 hp (97 kW; 132 PS) and 149 lb⋅ft (202 N⋅m) of torque with 9.2:1 compression ratio in the Cherokee and Comanche. Note that the TBI system was made by Renix and used from mid-1986-August 1990. Wikimedia Commons has media related to AMC straight-4 engine. ^ a b Ackerson, Robert C. (1991). The 50 year History of the Jeep. Motorbooks. ISBN 978-0-85429-533-3. ^ a b "Looking under the hood - Jeep power for AMC". Popular Mechanics. 160 (4): 114, 153. October 1983. Retrieved 29 February 2012. ^ Lee, Christian (2007). High-Performance Jeep Wrangler TJ Builder's Guide. CarTech. p. 26. ISBN 978-1-932494-26-6. Retrieved 29 February 2012. ^ Zapp, Eric (2006). High-Performance Jeep Cherokee XJ Builder's Guide 1984-2001. CarTech. p. 99. ISBN 978-1-932494-14-3. Retrieved 29 February 2012. ^ Clark, Robert. "The AMC 2.5 liter four-cylinder engine". Allpar. Retrieved 29 February 2012. This page was last edited on 2 February 2019, at 21:46 (UTC).